Domenico (also known as Giovanni Domenico or Giandomenico) was the son of the celebrated Giambattista Tiepolo. He trained with his father in the early 1740s and worked with him as an assistant and collaborator through- out the latter’s life, as well as working as an independent master. After his father’s death in Spain – where Domenico had accompanied him to assist with decorations in the Royal Palace – Domenico returned to Venice and there became a prominent artist in his own right, working in a style dependent on but not wholly subservient to his father’s. He was elected president of the Venetian Academy in 1780. From the start, Domenico was a vigorous and prolific draughtsman and his finest achievement is a series of 104 drawings depicting the experiences of the ‘everyman’ figure, Punchinello. The drawings were begun when he was an old man, shortly after the fall of Venice to Napoleon in 1797. Domenico knew the popular character of Punchinello from the traditions of the Neapolitan commedia dell’arte, and he had already treated the subject in the frescos of the Tiepolo family’s villa (now Palazzo Rezzonico, Venice) at Zianigo, which he painted in 1793–97. Punchinello is the humpbacked, pot-bellied figure with a beaky mask who wears a baggy white tunic and a sugar-loaf hat. Traditionally he was a coarse and quarrelsome character who epitomised the baseness of human nature. In England he was the origin of Mr Punch in the Punch and Judy show. The series was conceived with a title page, DIVERTIMENTO PER LI REGAZZI (an entertainment for children), and was long unknown until its appearance at a Sotheby’s auction in 1920. It remained intact only briefly before the drawings were resold the following year and then dispersed throughout various museums and private collections. The series starts with Punchinello’s family history before moving on to the subject of his birth – he is hatched from a giant egg incubated by a turkey. It includes scenes related to his childhood, his marriage and, finally, his deathbed. Along the way there are a host of far-fetched adventures, notably Punchinello’s travels abroad and his arrest and imprisonment. The drawings are all numbered in the upper left margin but this does not correspond to the flow of a narrative sequence. However, the series can be divided into a number of thematic groupings: Punchinello’s ancestry and childhood; his various trades and occupations; his adventures when travelling abroad; his social and official life; his last illness and death. Domenico apparently devised the story as he went along, more often than not incorporating an entire crowd of Punchinellos into a single scene so that it is impossible to distinguish a single hero. 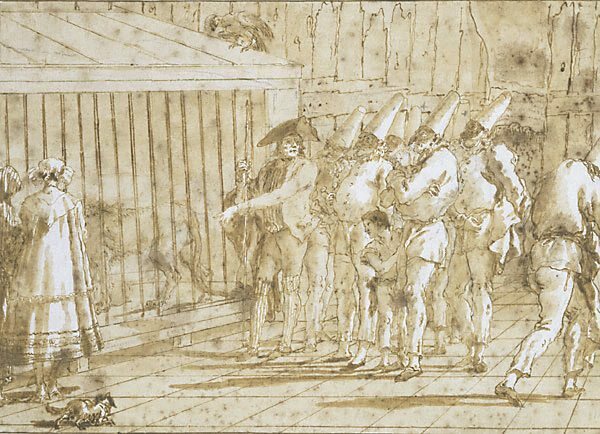 The Gallery’s drawing is one of six depicting the subject of Punchinello at the circus, all of which feature the same backdrop of a fence made of rough planks. It shows a group of Punchinellos listening attentively to a lion keeper who shows off the animal in his charge. The enthralled audience also includes a couple of ladies, together with a small pet dog approaching the cage with a mixture of caution and trepidation. Signed c.r. [on banner], pen and brown ink "Dom Tiepolo...". Not dated. Renée Free, AGNSW Collections , 'The Western Heritage, Renaissance to Twentieth Century', pg. 108-172, Sydney, 1994, col illus p 122. Art Gallery of New South Wales Annual Report 1994 , Sydney, 1994, p 44. Art at auction , London, 1967, p 110, illus p 111. Prints & drawings Europe 1500-1900 , Sydney, 2014, p 104, col illus p 105.